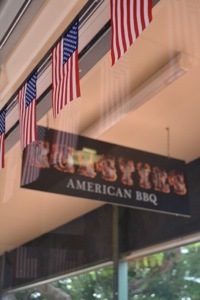 Restaurant review: Roasties American BBQ. I live in Brisbane Australia, and I have been developing techniques with cooking low and slow BBQ for some time now. I have experimented with my trusty old Masterbuilt electric smoker (set and forget) and more recently with a charcoal offset smoker (watch and worry). 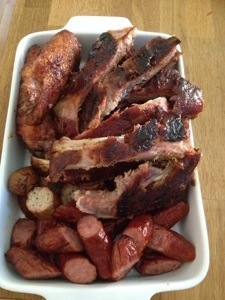 I mainly cook with pork ribs, and I have found it very hard to find a good quality rack that is value for money, and more importantly, has meat on the bone! Nearly all of the butchers that I use, bone out their own pigs, cutting as much meat off the bone as they can and not leaving much on! I either have to order in advance asking for extra meat, or, I have to purchase a whole belly section and get the butcher to trim it! 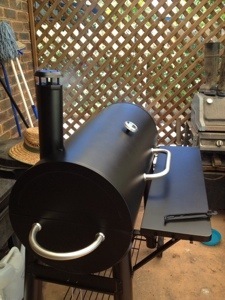 I also have also cooked sausage, turkey, brisket, pork shoulder and chicken on both smokers. I prepare the ribs with a dry rub, usually one that I make, and depending on how I feel, I will also use either Famous Dave’s or other shop bought rubs! I have experimented with making my own BBQ sauce, and at the moment I am keen on the “sweet and smoky barbecue sauce” which can be found on page 134 in Barbecue Bible, Sauces Rubs and Marinades, by Steven Raichlen. In order to take my smoking skills to the next level, I am embarking on an “educational” road trip to the USA in May for 20 days. I will be flying into Atlanta GA, hiring a car and driving around the home of BBQ! Other places that I will be visiting are; Huntsville AL, Lynchburg TN, St. Louis MO, Kansas City MO, Oklahoma City OK, Austin TX, Dallas TX, Little Rock AR, Memphis TN, Clarksdale MS, Augusta GA, Charlotte NC and Charleston SC. I will be visiting and reviewing as many joints as I can, across the 10 states, and I will even be competing with the team Too Sauced to Pork in the Memphis in May world BBQ championship in Memphis from 15-17th May! This experience alone will be the “Holy Grail” of my BBQ journey as I will be surrounded by Championship winning pit masters, who are willing to share tips, techniques and a drink or two, the whole point of my trip! I will be writing a daily blog about the road trip with links and photos, along with any reviews that I get to complete. I have decided to base each review on five different categories with a score out of 10 for each. 1. Restaurant appearance and ambience (inside and out). 2. Menu selection (range, specials). 3. Service (speed, accuracy and friendly). 4. Food (appeal, taste and portion size). 5. Cost (value for money). I will finish each review with my overall experience comments. In an attempt to sharpen up my reviewing skills, and to practice writing blogs, I have decided to start by visiting the small offerings available in my own backyard, and review them as a blog in preparation for my trip. Whilst there are not many American BBQ joints in Brisbane, those that are here, claim to be ‘genuine’ or ‘traditional’ American BBQ! Some even claim to have the best ribs in town! I have three months to visit as many as I can, and I am hoping to provide a fair and honest review of each. For me, the food in the restaurant has to be something that is ‘better’ than the BBQ I cook at home. That will be my benchmark as I know what my BBQ tastes like, and what I am expecting others to at least taste like! Roasties American BBQ, Wellington Point, Brisbane. Some even claim to have the best ribs in town. 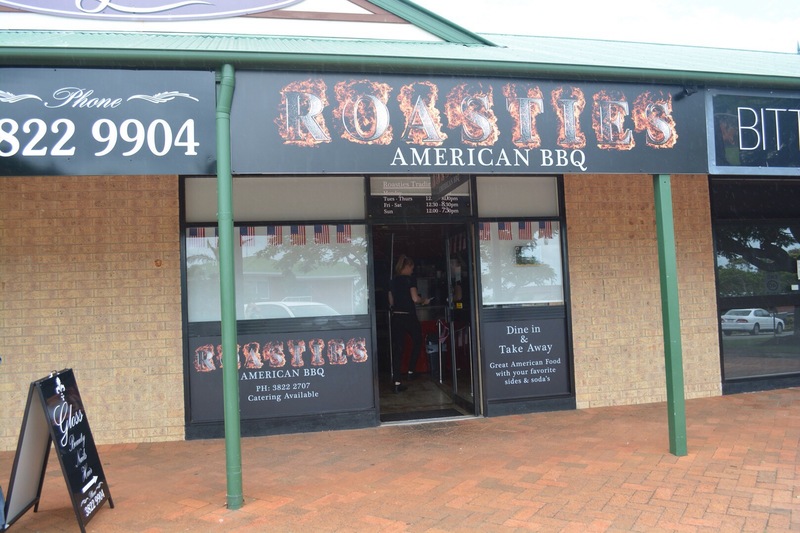 I had to start my review somewhere, and decided to try Roasties American Barbecue, at Wellington Point. I visited Roasties for lunch, and arrived just on opening at 1230. The front of the shop was typical of most BBQ joints, not much too look at, which is not a bad thing, and the signage made it clear on what was inside. 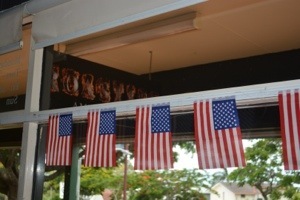 The banner of American flags above the door also helped in identifying the place wedged in amongst other shop fronts. Inside was just what I expected, and I liked the table with chairs, and the small stand up bar with stools to sit on if you wanted. 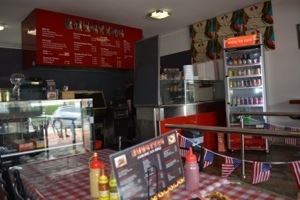 The tables had plastic red and white chequered table cloths and had a menu holder with a selection of hot sauces, and yellow mustard and ketchup plastic bottles. Past the tables was the food preparation area with fryers and grill underneath a large menu, along with glass display cases full of different types of soft drinks and dessert choices. 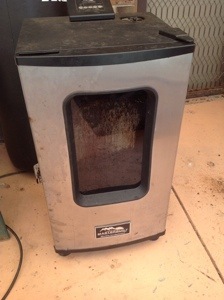 The first impression that I had was when I entered, was the lack of smoke, hickory smell or even any product in the ex ‘charcoal chicken’ coal rotisserie! There was no sign of any other smoking device, and when questioned,the staff member said that the rotisserie was what the food was cooked on. This was a bit disappointing as it would imply that there was no freshly cooked product for the lunch service, not a good start! The lack of smoky aroma and no BBQ cooking on arrival was disappointing, along with no extra BBQ sauce available on the table. The menu at first glance appeared to offer a variety of true American fare, with all the usual suspects. Pork ribs, pulled pork, brisket, charcoal chicken or wings, various ‘flavoured’ fries, sandwiches and just the one type of burger. There was no special for the day posted or mentioned in store, however, there was a Facebook special on offer, involving a burger and drink deal. As I was keen to try a little bit of what was on the menu, I asked if there was a combination plate. 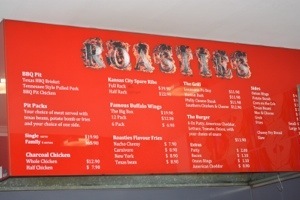 The waitstaff (partner of the owner), pointed out the Pit Pack on the menu. This consisted of a choice of meat served with Texas beans, potato bomb (baked spud) or fries and your choice of one side. I asked whether, if I purchased one of these with the pulled pork, would it be possible to just get a few slices of brisket added to taste. This was not possible and I was told that I would have to purchase the brisket as a side! The addition of a combo plate would enhance the menu selection. It would also be nice to be offered the special of the day in the restaurant, rather than online. There was no one else in the restaurant when I was there, and the two staff were quite willing to answer my multitude of questions. The service was quick and the order when served was accurate. The answers soon dried up after I started taking photos of the menu items. I am not sure why, as all those that I have spoken to in the BBQ fraternity, are more than willing to share tips on how to make great BBQ. The service was fast and fairly friendly, although I left feeling that it may have been different if it had been busier. 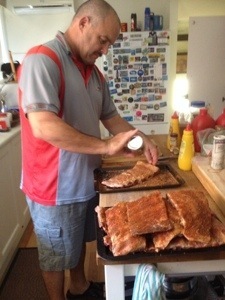 The one thing that I have learnt about BBQ, is that those who cook it, are passionate about the product that they serve. 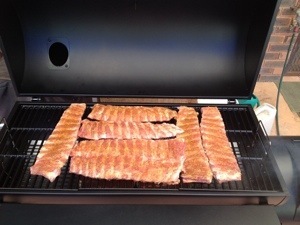 Appearance is everything, and not only should BBQ look good, it should smell and taste good. Sadly today, there was none of that passion, the impression that I got was that the person preparing my meal, did not cook it. If he did, he lacked the passion! I may be wrong, but I can only compare my standard of food to that served in front of me. Remember, the food at ‘any’ restaurant should be either on par, or definitely better than the food you cook with passion at home! 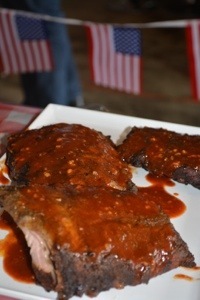 The ribs appearance seemed fine, however the sauce that came with them was all that you got. Taste wise, it was apparent that there was no smoke involved in the process and the taste was quite bland. 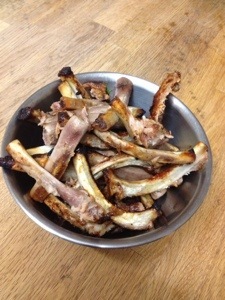 My main issue with most rib places in Australia, is the fascination with the meat “falling” off the bone! This does not determine how good a rib is. 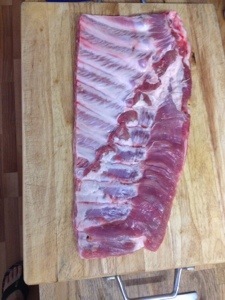 Sure it tells you that it has been cooked, but I could boil ribs in water and the meat will fall off the bone! 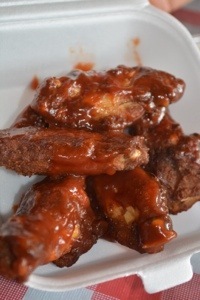 A good rib should have flavour in every bite, that makes you want to eat more. These ribs lacked that, and to make things worse, appeared to still have the membrane attached to the bone side! Funny enough, there was a sign down the road claiming to have the best ribs in the area, perhaps I should have gone there! The Pit Pack with the pulled pork was short of disappointing. Neither the onion rings nor the fries looked hand made. The fries I can understand, but it’s the little things that make you go from average, to great. 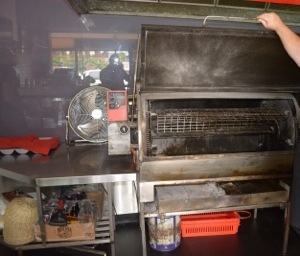 It’s all about the passion, I have seen other places in Brisbane with hand cut fries and onion rings! 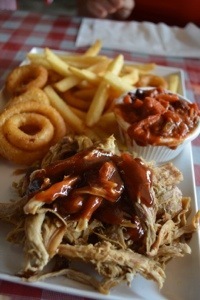 With regards to the pull pork, just like the ribs, it lacked any BBQ taste or texture. The Texas beans had good texture, and tasted good enough. The pork looked like it was cooked at a much earlier time and was a little dry, if I’m wrong and it was ‘fresh’, there was no sign of any others being cooked ready for this one to run out at lunch. Again like the ribs, there was a sauce shortage, a pity. The buffalo wings were actually nice. Although they were small, they had enough sauce and tasted ok. They came with a small tub of blue cheese dip, and would have been even better with some celery or carrot. 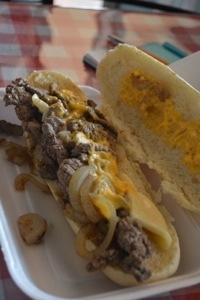 The Philly cheese steak sandwich was disappointing in both appearance and taste. It needed more cheese, and the steak did not look like it was cooked with much passion or heat on the grill. Finally, the side of brisket came with three slices, and although moist and tender, lacked any BBQ flavour. A few burnt ends would have helped. The food whilst large in portion size, lacked flavour and appeared to be not freshly cooked for the first service of the day. There was not much ‘love’ put into the cooking of these dishes. I have always said that we pay too much for BBQ in Australia, and anything over $40 for a full rack of pork ribs is too much. Roasties have their full rack at $39.90 and a half at $22.90. If the ribs were the best that I had ever tasted, I would say it was justified. In this case, paying that price for the ribs was not value for money. The Pit Pack was not value for money, take out the fries and onion rings ( I could have just visited Hungry Jacks), and essentially you are paying $19.90 for a serving of bland pulled pork. The Buffalo wing cost over $1 each, and would have been value for money, if they had been larger. Finally, the Philly cheese steak. This was something that I was looking forward to trying, but what I was served at $11.90, was not value for money. Large portions are not always best, quality should be a priority over quantity. I would not say that paying just over $73 for the five dishes and one soft drink was value for money. Especially when there was a mix up with the final bill, and what I payed was more than the menu price! My fault, I should have queried it, not a nice way to end a meal. Do you remember when you were a child at Christmas and you were excited about opening that first present, and when it wasn’t what you expected, you were disappointed? That is how I felt when visiting Roasties American BBQ. I had read all of the reviews online, and was impressed by the claims of food running out the door, as it was ‘just like in the states’. I was excited to test my quality of BBQ against a traditional BBQ joint! My overall experience started fine as I walked in the door, and the cracks appeared from there. From the lack of aroma or food cooking on the ‘smoker’, to the quality of food produced, my worst Christmas present became a reality. 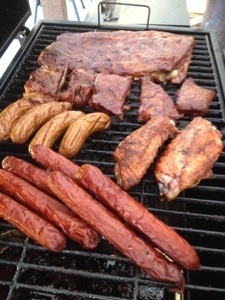 BBQ is a journey and not just a business, if your heart is not in it, you should not be in it! I did not feel the passion whilst dining here, and I would have been more impressed if the owner was actually cooking the food or at least standing in the background, proud of the food served. It is a bit like a publican in a bar, you don’t have to pull the beer, to pull the crowd. If I am going to spend over $70 for a meal, I expect to get value for money, that didn’t happen today. Would I recommend Roasties American BBQ to others? Probably not in the immediate future. They have the right idea, but I feel they lack the passion and need a larger than life personality who cares about the quality of food served to enable them to become a ‘traditional’ BBQ restaurant. Look at all the great places in the USA and you will see what I mean.